“Moses and the prophets warned you against pride, arrogance, and the worship of riches. They commanded you to help the needy.” Sharing the gospel should be one of the goals of every Christian, this book illustrated the story “ The rich man and Lazarus” based on the scripture. Lazarus, a beggar, was homeless and thus considered as the “needy” in the book. Whereas the rich man, passing by the poor Lazarus everyday, looked down at him and didn’t show a trace of sympathy. When both of them died, Lazarus went to heaven while the rich man went to hell, for Lazarus had nothing when the rich man enjoyed his life on earth. Later the rich man asked Abraham to let Lazarus go to his five brothers and warn them not to make the same mistake he did, and that’s where the novel delivered Abraham’s message. The dialogue and visuals of this graphic novel is very impressive. The story is based on Luke 16:19-31 of the scripture, which lasted for a page or two. To expand the plot, the novel illustrated dialogues between the rich man and Abraham, Lazarus and Abraham, and Lazarus and his children. All the dialogues help portray more memorable characters (i.e.Showing how the rich man stilled looked down at Lazarus when both of them died) while giving a deeper understanding of the message this novel is trying to convey (i.e. the conversation between Abraham and the rich man, where Abraham nearly shared the gospel directly to the audience). The visuals played an important role when it comes to distinguishing the settings of heaven and hell. In heaven, people were friendly with each other, they sat around tables and talked, and artist used blue to show the calmness. On the contrary, the setting of hell was eerie and agonising, red and black were used to represent fire and the endless darkness, which could also be an allusion here, indicating how sin brought people to endless darkness with scorching flames around them. Speech bubbles were drawn where there’s no drawing behind it, which makes them easy to read. The characters could be the novel’s weakness. The author added more characters to expand the plot and foreshadow what’s to happen next. However, some of those characters did not contribute much since they sometimes say very few lines. Moreover, this large number of characters leads to confusion because to me nearly everyone looks the same! Even now I still can’t see the difference between Jesus and Michael the archangel… In the scripture, very few characters were given and the story was easily interpreted. However, with all kinds of illustrations shown in the novel, i.e. Dialogues, colours, speech bubbles, this many characters just made the book out of order, as if everything is tangled up and there’s no way to get a clear interpretation of each and every single character. The graphic novel would appeal to teenage boys as the illustration is done in a “wild” style. Those who does not enjoy reading conventional books, especially the original version of the scripture (especially KJV!) would enjoy it too. The biblical accuracy in this book is amusing, the settings and messages delivered fit exactly to what was written in the scripture, therefore it’s also a good way of sharing biblical stories with kids who are not old enough to understand the complexity of the Holy Bible. 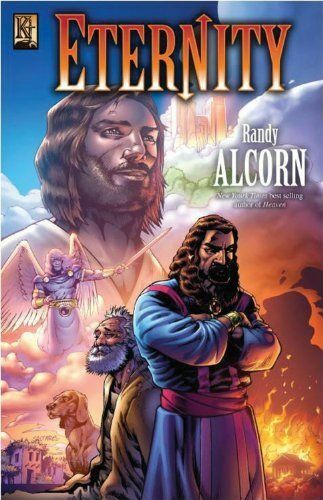 This novel is not recommended to people who are more serious about the topic of christianity since the illustrations are done in a cartoonish way. In my opinion, this novel should be considered as literature. It has creative drawing and well developed plot, with an idea of spreading God’s word and sharing the gospel. There are many angles that can be pursued when thinking about the Bible as literature, this novel is definitely one of the ways to look at the scripture and giving people a deeper understanding about it.